The Multihalle consists of two shells that are connected via a canopied walkway. The entire structure measures 160 x 115 metres. The highest dome point is 20 m above the ground. Its widest span is 60 m, its longest is 85 m. The lattice consists of two resp. four layers of interweaving slats of Canadian hemlock wood, placed 50 cm apart. Each lattice slat is 5.5 cm wide. The shape was calculated at the Atelier Warmbronn with the aid of a hanging model, and photogrammetically assessed and converted into a digital model by Klaus Linkwitz. 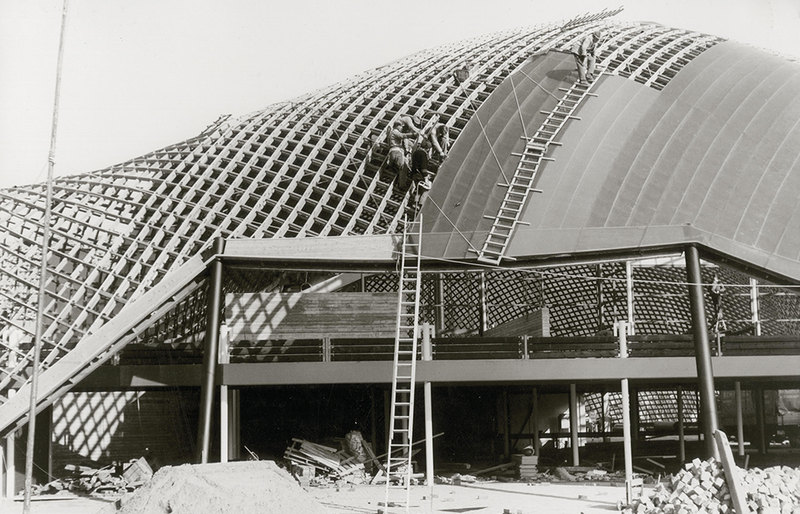 Ted Happold conducted the complex calculations at Ove Arup’s studio in London. The construction stability calculations were verified by hanging water-filled waste bins from the roof construction. In 1981, the awning had to be replaced as the original material, made of PVC-coated blackened trevira fabric, had begun to show leaks. The new, white awning has proven to be significantly more durable. 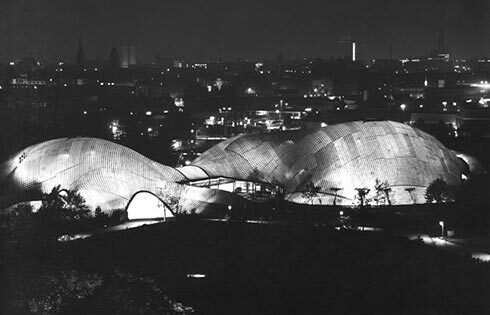 Today, the Multihalle is still the world’s largest self-supporting timber grid shell structure, and is considered a predecessor of many contemporary glass dome structures.